The chart of elements, dating from 1885, was discovered in the University’s School of Chemistry in 2014 by Dr Alan Aitken during a clear out. The storage area was full of chemicals, equipment and laboratory paraphernalia that had accumulated since the opening of the chemistry department at its current location in 1968. Within the collection was a large, extremely fragile periodic table that flaked upon handling. Suggestions that the discovery may be the earliest surviving example of a classroom periodic table in the world meant the document required urgent attention to be authenticated, repaired and restored. The University’s Special Collections was awarded a funding grant from the National Manuscripts Conservation Trust (NMCT) for the conservation of the chart in collaboration with private conservator Richard Hawkes (Artworks Conservation). The funding also allowed production of a full-size facsimile which is now on display in the School of Chemistry. 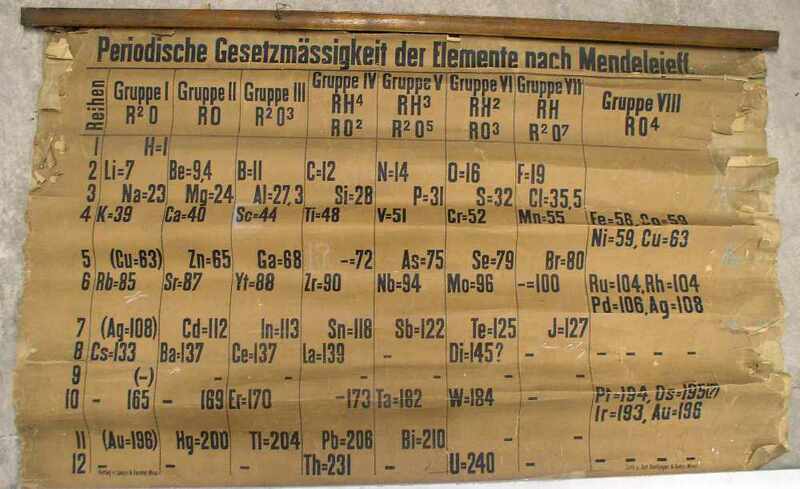 The original periodic table has been rehoused in conservation grade material and is stored in Special Collections’ climate-controlled stores in the University. “The discovery of the world’s oldest classroom periodic table at the University of St Andrews is remarkable.